Little bluestem, one of the toughest native grasses and, to my eyes, one of the most beautiful, is putting out its seed stalks now and will soon flower. We’re having a heat wave; this weather shows the benefit of planting natives. 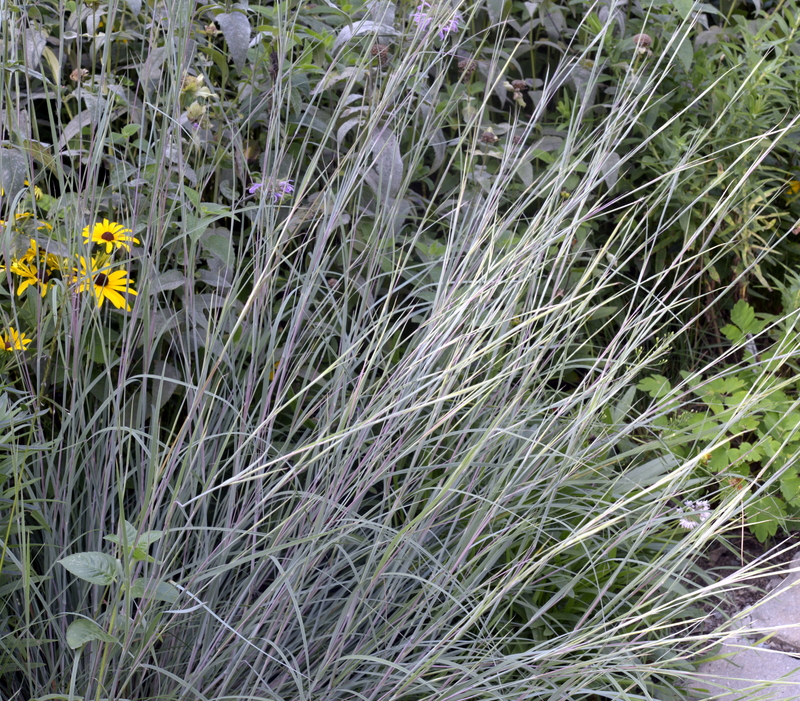 Tough prairie plants stand up to heat and drought and just go on blooming. The sunny border is at its most colorful and exuberant right now. — it will soon be a good time to prune woody plants. Once all growth, flowering, and fruiting are done, the plants are relatively, but not completely, dormant, giving you a window of time to prune before they get ready for their next critical task: leaf abscission (shutting down for the winter). I do most of my pruning in winter, but I also prune back shrubs as needed after they have ripened their fruit. — follow a sustainable lawn care regimen: if you feel you must fertilize your lawn, best practice is to give it no more than two applications of slow-release organic fertilizer each season, around Memorial Day and Labor Day. It’s too late now to reseed bare areas: wait until early fall. 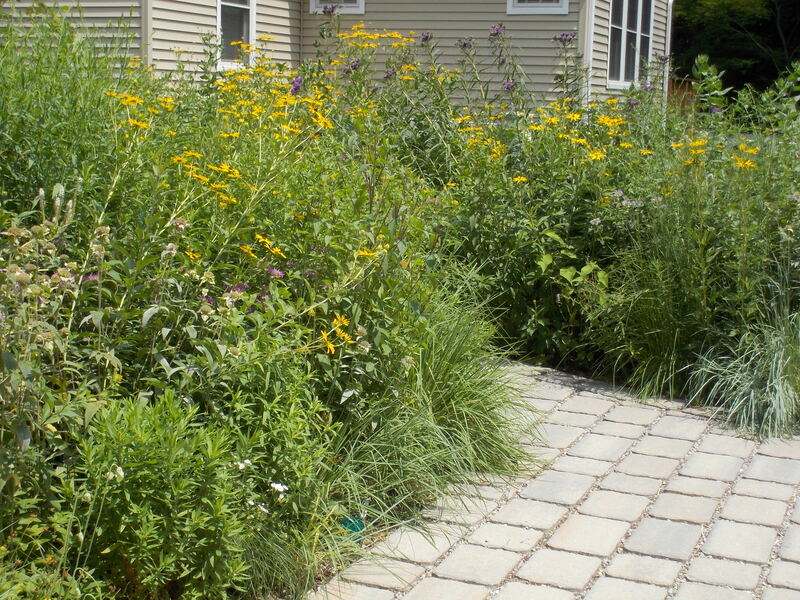 (Better still, if you have a place where grass won’t grow, plant something that will, like shade-loving native perennials.) Let the grass grow at least 3″ tall for maximum photosynthesis. Lawns do not need water now (or ever), but if you do water, do it infrequently and deeply to encourage deep root growth. One inch of water once a week is much better than a few minutes each day (watering every day is likely to cause fungal diseases). But remember: the more you water, the more you’ll have to mow! If you hold off on watering entirely, your lawn will go dormant until the next rain, but it will not die. Stay cool! I wish everyone a shady patio and a glass of lemonade this weekend. 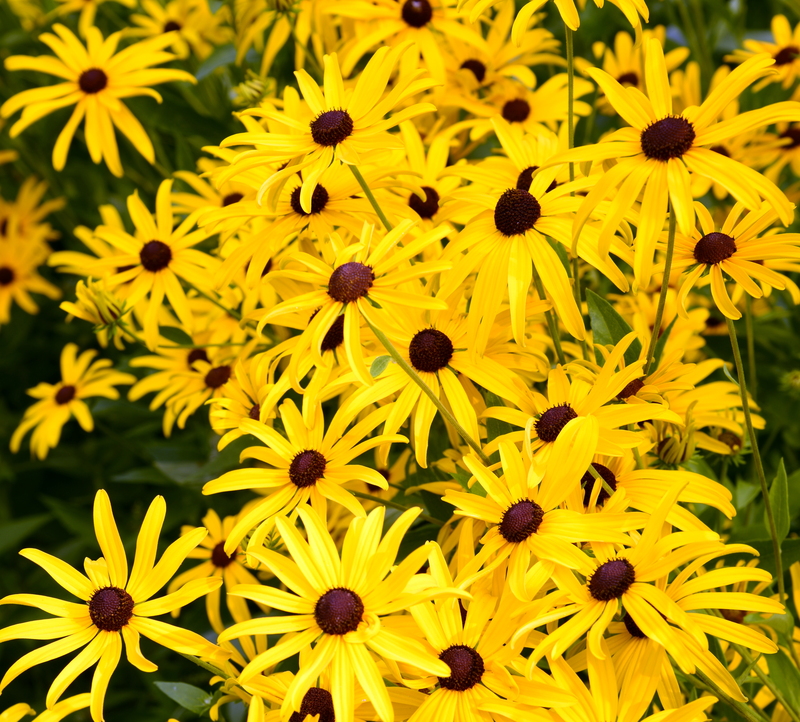 Sometimes Rudbeckias are almost too exuberant. You can find them in any size to suit your garden. This is R. subtomentosa, which grows up to 5′ tall. I give away plants every spring. 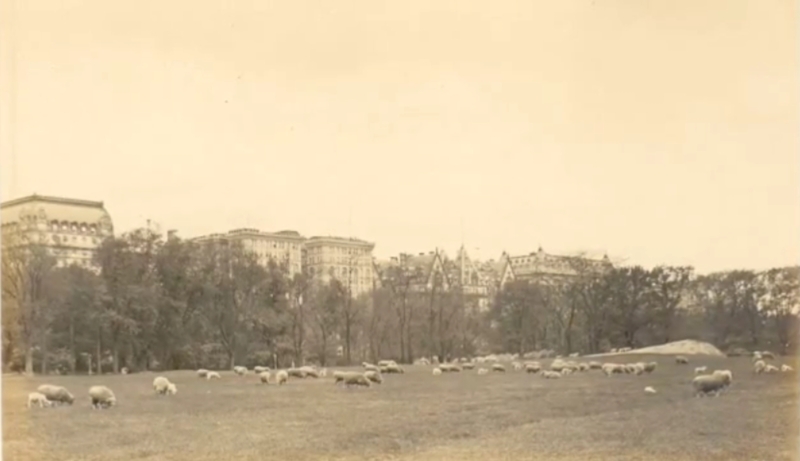 Yes, sheep grazed the Sheep Meadow in Central Park until 1934, when Robert Moses (who else?) had them moved to Prospect Park and then to the Catskills. Sheep Meadow was part of the original plan for Central Park; although it was first used as a parade ground for military drills, it soon became a peaceful bucolic space. And I bet that lawn was healthy, green, and sustainable while the sheep were there to maintain it. What is it about sheep? I’ve just finished reading The Shepherd’s Life: Modern Dispatches from an Ancient Landscape, by James Rebanks. The author grew up in the English Lake District in a family of shepherds and wanted nothing more than to follow in his grandfather’s and father’s footsteps: raising good sheep, maintaining the family farm, and carrying on an ancient tradition. But he also, rather improbably, went to Oxford, and he advises UNESCO on sustainable tourism, traveling all over the world to examine traditional ways of life. The book is an autobiography, but it’s also a detailed description of a place (one of the most gorgeous places on Earth) and a way of life that used to be common but that has nearly disappeared. Rebanks and his fellow shepherds practice traditional pastoral techniques: moving sheep throughout the seasons to use the land sustainable, raising breeds of sheep that are best adapted to a harsh environment, caring deeply for the animals and the land. He says that the yearly rhythms of the Lake District haven’t changed appreciably in 1000 years (and that the millions of tourists who visit the Lakes each year are completely oblivious to the traditional way of life that’s going on all around them). His appreciation for the flowery, fragrant, vitally important hay he makes to keep the sheep going all winter, and his despair when a wet harvest season destroys it, are equally memorable. I learned that sheep are much smarter than I thought: older ewes know how to shelter from a snowstorm, for example, and will prevent younger, inexperienced ewes from choosing a more dangerous spot. I also learned that sheep dogs are just as smart as I thought, if not smarter, and that their work is absolutely essential, but that you can spoil a good dog with poor training. I learned that pastoralism is muddy, bloody, and often, to a city dweller, just plain gross, and that city folks who try it often can’t make it through the first (8-month-long) winter. The descriptions of the work involved in protecting the sheep during a snowstorm, or caring for them during lambing time, are unforgettable. In case you’d like to see sheep on a daily basis, take a look at Google Sheep View, a site that uploads images including sheep from Google Street View every day. You’ll see some beautiful parts of the world. 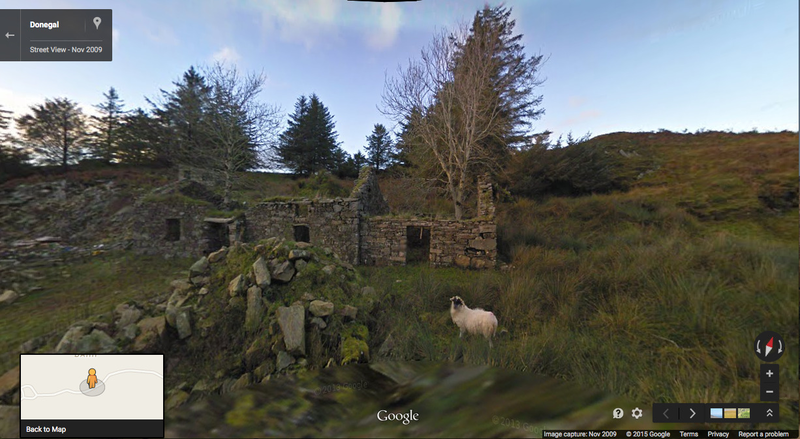 Here’s a “haunted ghost sheep” in Donegal, Ireland. The border has finally turned yellow! Two species of Rudbeckia create the fire, along with two species of perennial sunflower and some late-blooming butterflyweed. The tall purple flowers floating in the breeze are ironweed, Vernonia fasciulata. 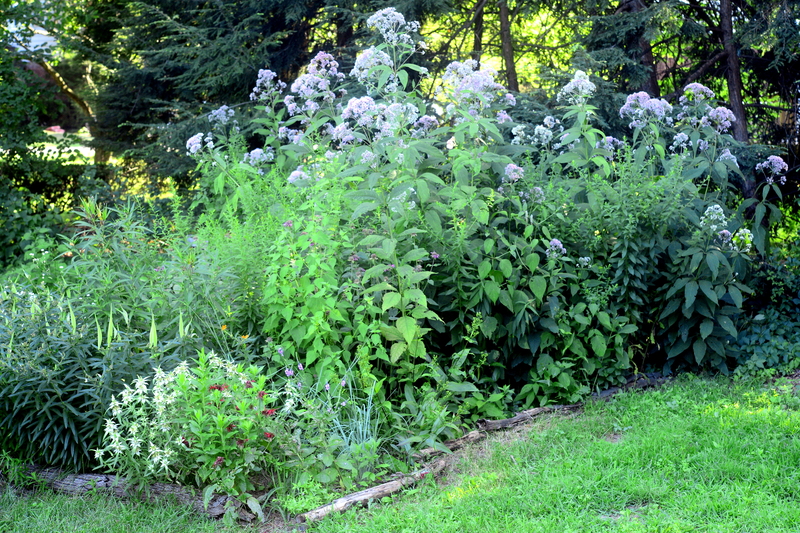 Sweet joe pye weed (Eupatorium purpureum) grows to great height with less than half a day of syn. This is the time of year when there’s little to do in the ornamental garden (except admire it), although the vegetable garden needs continual tending. After last week’s oppressive heat, the weather has been pleasant, but much too dry. We are in a drought: precipitation levels have been below normal for the past 90 days. So pay particular attention to the water needs of your vegetable garden and newly installed woody plants and perennials. — water new plantings: newly installed plants and annuals, like vegetables, need watering. Any week in which we receive less than an inch of rain, water all woody plants installed this spring or last season. Perennials planted last spring should be well-established, but those planted last fall and this spring need supplemental watering during dry spells. How do you know when we’ve received an inch of rain? I use a highly sophisticated rain gauge–an old yogurt container placed on the ground among the plants. A tunafish or catfood can works equally well. — it’s not too late to extend a garden bed or start a new one, and it’s always a great idea to eliminate some lawn: spread a 3-4 inch layer of cedar or hemlock bark mulch over the area to kill the grass. In the fall, you’ll be able to plant right through the dying grass and mulch. I mulched an area of lawn about a month ago and am scattering perennials seeds there as they ripen. Columbine is almost finished ripening seed, and coreopsis seed ripens nearly every day. — it will soon be a good time to prune woody plants. Once all growth, flowering, and fruiting are done, the plants are relatively resting, giving you a window of time to prune before they get ready for their next critical task: leaf abscission (shutting down for the winter). I do most of my pruning in winter, but I also prune back shrubs as needed after they have ripened their fruit. — follow a sustainable lawn care regimen: if you feel you must fertilize your lawn, best practice is to give it no more than two applications of slow-release organic fertilizer each season, around Memorial Day and Labor Day. It’s too late now to reseed bare areas: wait until early fall. 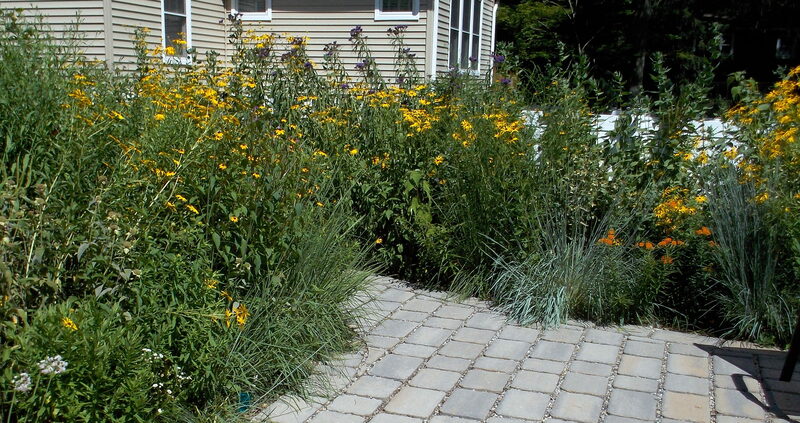 (Better still, if you have a place where grass won’t grow, plant something that will, like shade-loving native perennials.) Let the grass grow at least 3″ tall for maximum photosynthesis. Lawns do not need water now (or ever), but if you do water, do it infrequently and deeply to encourage deep root growth. One inch of water once a week is much better than a few minutes each day. But remember: the more you water, the more you’ll have to mow! If you hold off on watering entirely, your lawn will go dormant until the next rain, but it will not die. 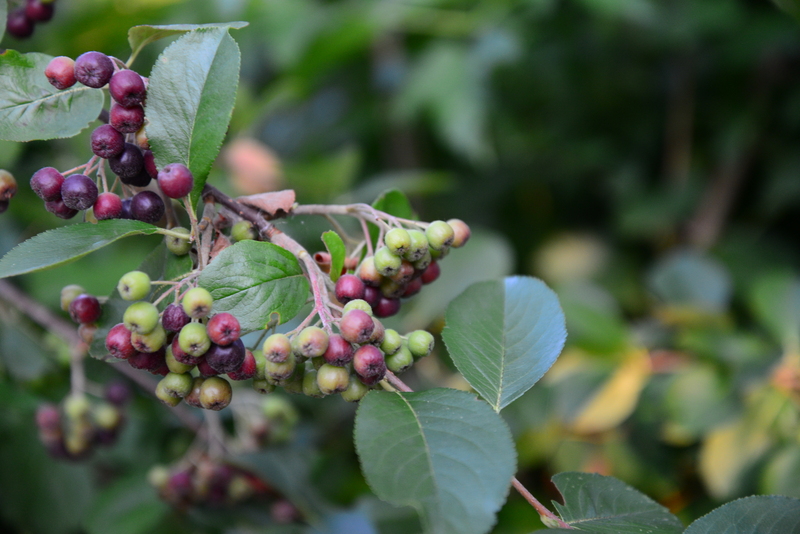 It’s a lazy time for humans in the garden but a busy time for birds, as several native shrubs ripen their fruits. Elderberry, grey dogwood, and black chokeberry fruits (shown here) are gradually ripening, and the birds check them out every day. Hazelnuts ripened this week, and all that’s left are piles of hulls on the ground. My latest Backyard Environmentalist column appeared on the North Jersey newspapers website and in the Glen Rock Gazette today. Please take a few minutes to check it out. Stay cool, and enjoy the garden this week! 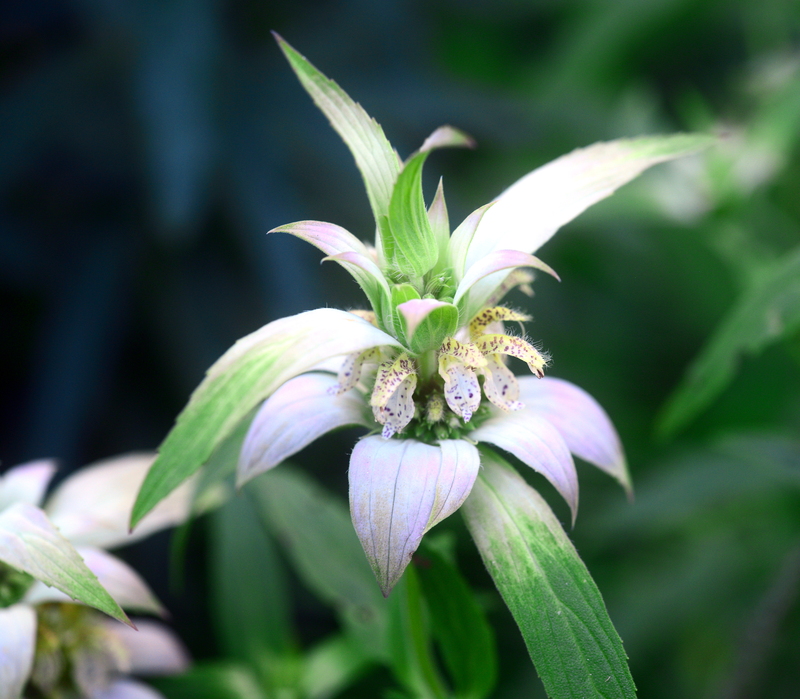 Beebalm (Monarda fistulosa) is an easy-to-grow native plant that belongs to the Lamiaceae, or mint family. The square stems, strongly opposite leaves, and lipped flowers are family characteristics. The Lamiaceae (the “-aceae” ending, pronounced “A-C-A,” always denotes a family) is a large and widespread plant family that includes over 230 genera and 7,000 species, mostly forbs (non-woody flowering plants) or small woody plants. It is commonly referred to as the mint family, and it includes most of our common culinary herbs, including the mints, basil, thyme, marjoram and oregano, rosemary, sage, and lavender. It also includes many familiar garden plants: in addition to beebalm (bergamot, Monarda), these include Agastache, Ajuga, Callicarpa, Caryopteris, Coleus, Glechoma (a weed), Lamium, Nepeta (catmints), Physostegia virginiana (obedient plant, a native perennial), Salvia (ornamental sages), and Stachys. The aromas and flavors that make many members of this family pleasing to us as culinary herbs make them displeasing to animals. Most furry pests, like deer and rabbits and woodchucks, avoid all members of this family, which is why you can plant most culinary herbs (with the exception of parsley and dill, both members of the Apiaceae) in an unfenced garden. Although some insects do attack mints, most critters leave them alone. Which leads us to their greatest benefit in the garden: they are distasteful to most four-footed garden pests, so if you scatter them throughout the garden, they protect or hide the more appealing plants. For example, Asters, Coreopsis, Phlox, and Echinacea are extremely attractive to deer and rabbits.But it you place these plants among members of the mint family, and they are much less likely to be eaten. There are numerous native family members. 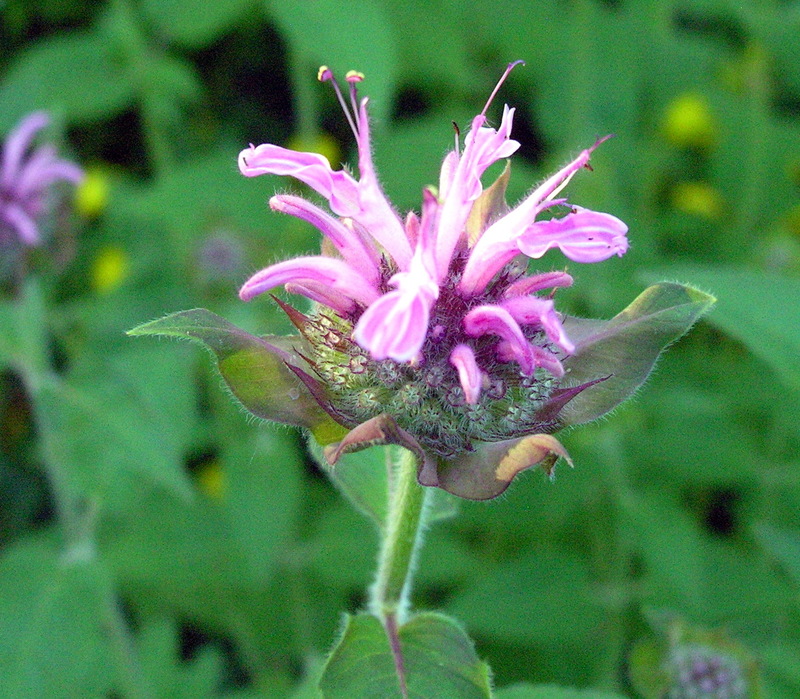 Best known are several species of Monarda: M. fistulosa, shown above, blooms in shades of pink and lavender; M. didyma has bright red flowers. Both are about 3-4′ tall, perennial, and very easy to grow as long as they get at least half a day of sun. M. punctata, dotted mint, is an annual, although it self-seeds easily. It’s about 2′ tall, also a sun-lover, and is in bloom right now. Dotted mint (Monarda punctata) is in bloom now. Notice the beautiful flame-shaped milkweed pods behind it. There’s some late-blooming M. didyma to the right. M. punctata’s flowers are the small, lipped, dotted structures. The large curved white “petals” are bracts, or modified leaves. Also in bloom now is Agastache foeniculum, or lavender hyssop, a biennial (but easy to keep going with seed). This plant has an anise, or licorice scent, and the edible flowers make a refreshing addition to salads (in small amounts only–the taste is very strong). It’s about 3′ tall and like its cousins needs a sunny spot. Agastache foeniculum (blue flowers to the right), which rabbits and deer don’t like, serving as a sentry beside Rudbechia triloba, which they do, very much. Little bluestem (Schizachrium scoparium) in late July, when the flowering stalks reach above the leaves. 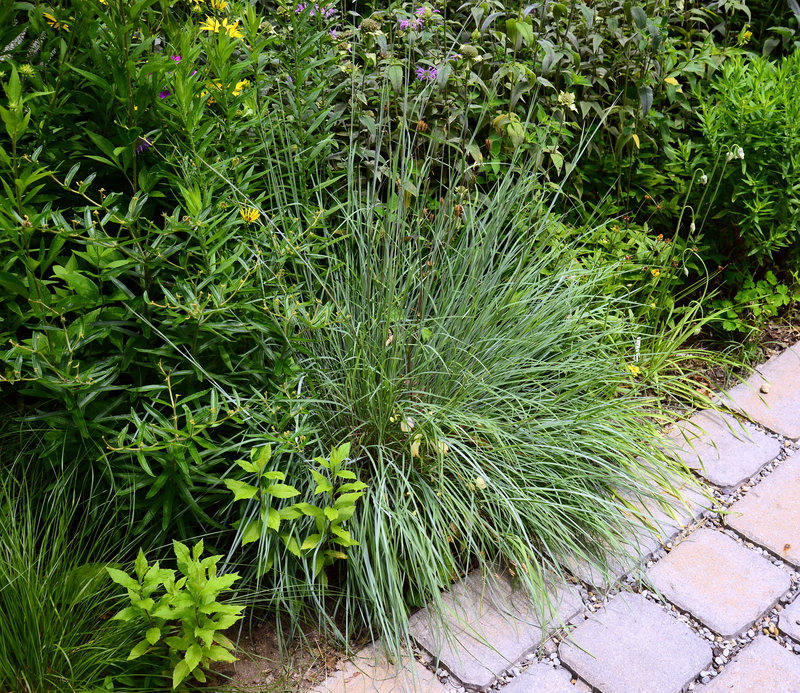 Little bluestem is the dominant grass of much of North America; it’s also one of the best native grasses for the average home garden. It’s a nice compact size, never reaching much above 3 feet tall, and for most of the growing season it forms a neat and beautiful mound shape. 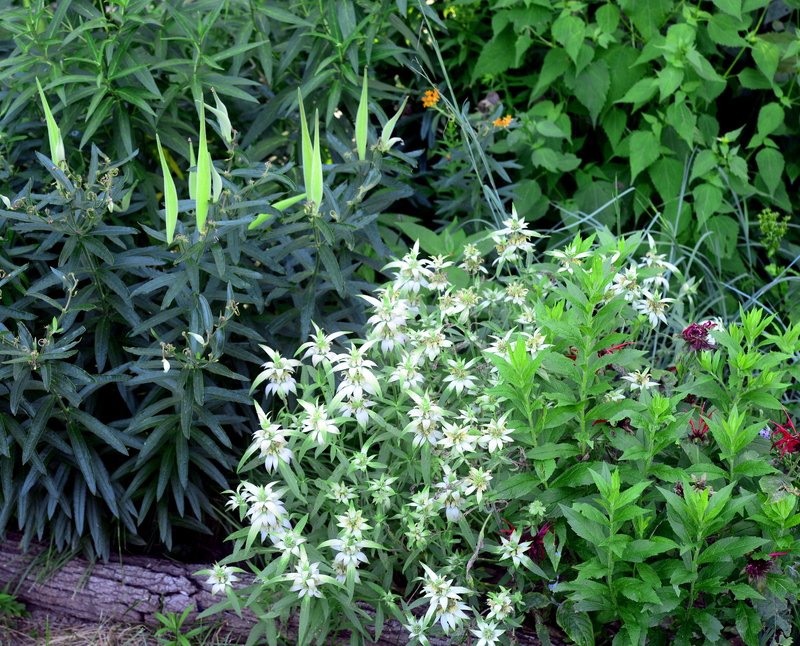 Individual plants show a great deal of color variation, ranging from deep green to subtle blue-grey. This time of year, it begins to stalk out, or send up flowering stems. The inconspicuous flowers are gentle shades of tan, green, purple, and blue, and the seedheads are golden. In fall, the plant turns first russet and then tan, and it glows in the sun. And the birds eat the seeds as fast as they ripen. 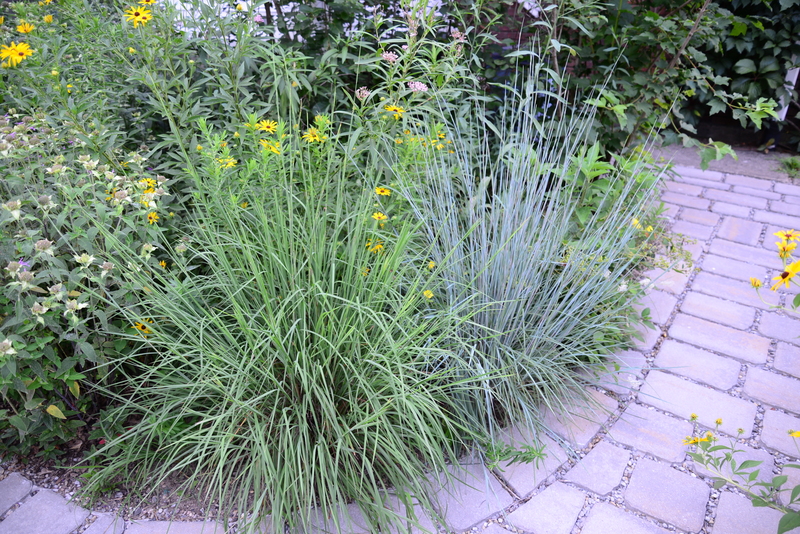 Individual plants of little bluestem show a great deal of color variation. The plant on the right shows how the species got its common name. The current hot, dry weather doesn’t bother this plant–in fact, it prefers it. It thrives in dry sites. If your soil is very rich or tends to be moist, choose a different prairie grass, such as prairie dropseed (Sporobulus heterolepsis). Prairie dropseed is finer-textured than little bluestem, but it is about the same height and forms a similarly attractive mound shape.When I plant prairie dropseed in my sandy soil, I mix in a scoop of compost. Prairie dropseed (Sporobolus heterolepsis). Photo taken from prairienursery.com. Today was a pick-your own day at the CSA we belong to, and we fully intended to have a nice trip up to Warwick, NY, pick peas, sugar snaps, and herbs, and buy strawberries and tomatoes at a farmstand, and get fabulous ice cream at a local dairy. But by 10:00 the temperature was over 90 degrees, so we decided to visit a farmer’s market instead. We went to the Ramsay market, a large one that operates on Sundays from 9:00 to 2:00 at the train station. They were out of strawberries, but we got gorgeous and delicious peaches, apricots, and plums, in addition to vegetables. If you don’t belong to a CSA or shop at farmer’s markets, I encourage you to do so. The Jersey Fresh website lists both by county. (If you live in northern New Jersey, check out the many small farms that operate in the famous black dirt region around Warwick, NY, at well). You’ll get fresh, healthful, and delicious produce while you help support open space and local agriculture. There’s no substitute for fresh tomatoes and basil. With tomatoes from the farmer’s market and basil from the CSA, I made a caprese salad that will form an uncooked sauce for tonight’s pasta. Here’s what you do: cut up 1 lb. of Roma tomatoes and about 12 oz. of fresh mozzarella cheese in 1/2-inch dice. Tear about 16 large basil leaves in small pieces. Mix everything in a large bowl (large enough to hold the cooked pasta, too), and season liberally with salt, pepper, and olive oil. You need quite a bit of olive oil. Cover and leave the sauce to sit at room temperature for several hours (the flavors will blend, and the tomatoes will release their juices). At dinner time, cook 1 lb. of pasta (tubular or shell shapes work best), drain, and mix the hot pasta with the sauce. Serve immediately. Serves 4-6 people. Leftovers can be refrigerated and then very briefly reheated in a microwave to bring them back to room temperature. 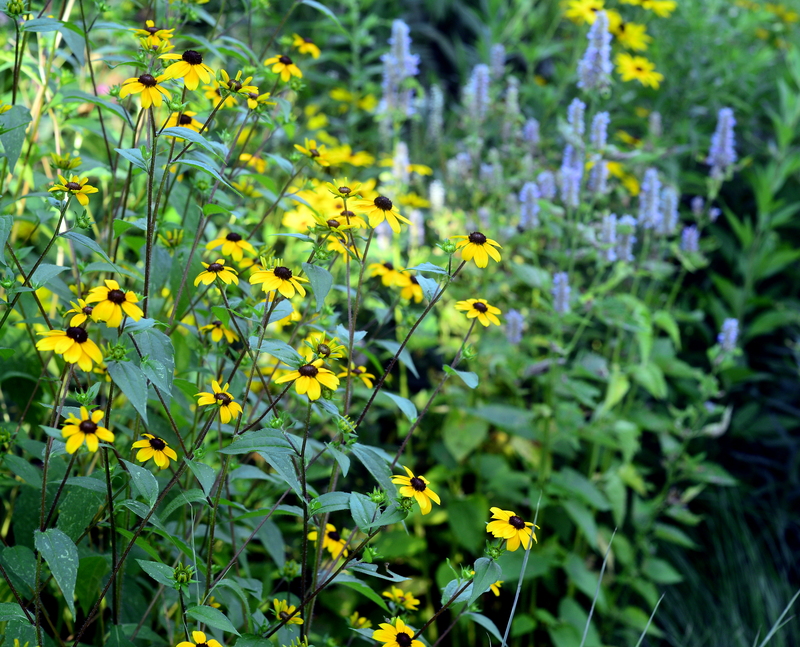 Everything’s finally turning yellow: Rudbeckia subtomentosa will dominate the sunny border from now through September. Compare this picture with the one taken on July 3. It’s a funny summer season: some plants, like Rudbeckia, are blooming a bit late; others, like Boltonia, are early. Shade asters are showing buds–surely it’s almost a month too early for that to happen–but sun-loving asters are not. In the shade garden, Eupatorium purpureum has reached the height of bloom, and the butterflies love it, as they do all plants in this large genus. Eupatorium purpureum in part shade, surrounded by some plants that have finished blooming and some others that haven’t begun yet. — water new plantings: for the first time in quite a while, we had a dry week, so newly installed plants need watering. Any week in which we receive less than an inch of rain, water all woody plants installed this spring or last season. Perennials planted last spring should be well-established, but those planted last fall and this spring need supplemental watering during dry spells. How do you know when we’ve received an inch of rain? I use a highly sophisticated rain gauge–an old yogurt container placed on the ground among the plants. A tunafish or catfood can works equally well. — practice good horticulture with warm-season crops such as tomatoes, peppers, squash, eggplant, beans, corn, and cucumbers: Monitor for insect eggs and larvae and remove them before infestations become serious. Throw out badly infested or diseased plants to prevent the spread of disease (do not compost diseased or infested plant material). Cucumber vines are showing signs of wilt: remove them immediately to prevent the spread of this fungal disease. — it will soon be a good time to prune woody plants. Once all growth, flowering, and fruiting are done, the plants are relatively dormant, giving you a window of time to prune before they get ready for their next critical task: leaf abscission (shutting down for the winter). I do most of my pruning in winter, but I also prune back shrubs as needed after they have ripened their fruit. — follow a sustainable lawn care regimen: if you feel you must fertilize your lawn, best practice is to give it no more than two applications of slow-release organic fertilizer each season, around Memorial Day and Labor Day. It’s too late now to reseed bare areas: wait until early fall. 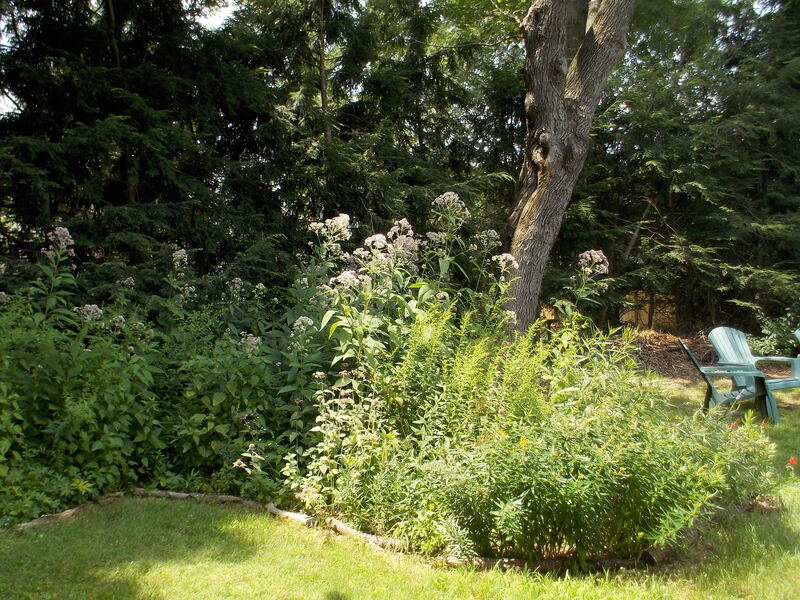 (Better still, if you have a place where grass won’t grow, plant something that will, like shade-loving native perennials.) Let the grass grow at least 3″ tall for maximum photosynthesis. Lawns do not need water now (or ever), but if you do water, do it infrequently and deeply to encourage deep root growth. One inch of water once a week is much better than a few minutes each day. But remember: the more you water, the more you’ll have to mow! Toward the back left of the photo, you’ll see Eupatorium dubium ‘Little Joe,’ a handsome cultivar I put in late last summer. So far, I’m pleased with it, but I’m not sure yet that it attracts pollinators as well as the species. 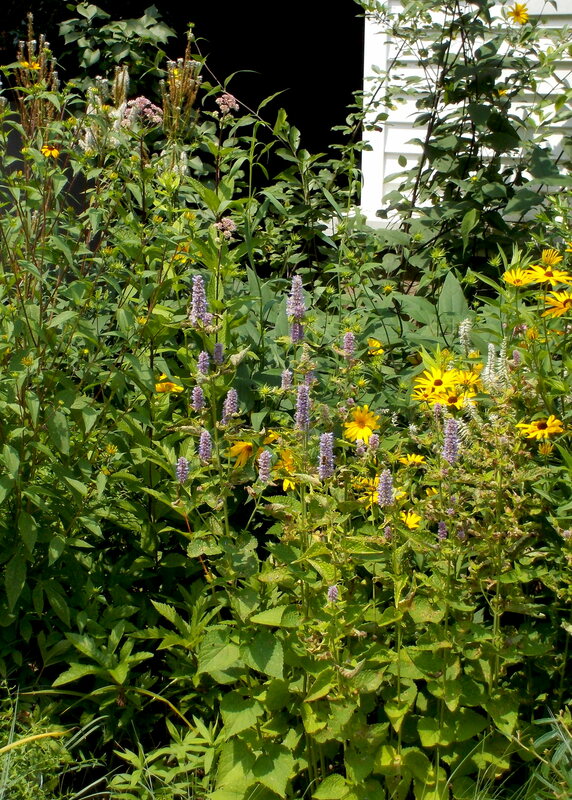 This grouping also includes culver’s root (Veronicastrum virginicum; white), a perennial sunflower (but I can’t remember which one), lavender hyssop (Agastache foenicuoum; light purple), and Rudbeckia (R. triloba and subtomentosa).